DJI Phantom 4 & Phantom 3 Advanced & Professional WiFi Signal Range Extender Antenna Kit. Lightweight, durable, pratical and convenient to use in compact design. Full range coverage, strong and stable signal improves both remote control and Wifi video connection performance. Our antenna kits will extend the range up to 4 times the DJI rating and help with the signal penetration around objects. Increases range from approx. 2.5 Km to up to 7.5 Km. Actual range extension will depend on your exact deployment environment, and is not guaranteed. 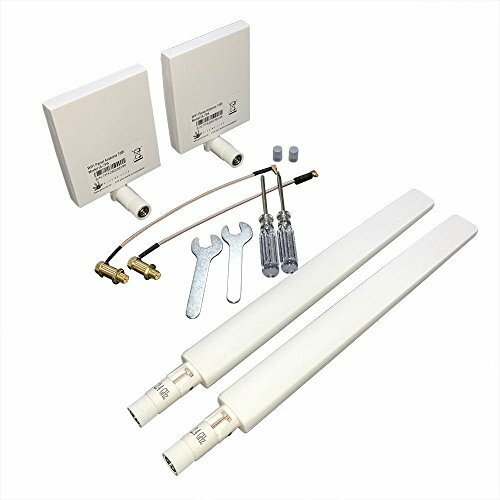 The high gain 7dBi panel antennas in this kit have been customized for extended WiFi spectrum. Normally, WiFi only operates on 2.4GHz. The ARGtek panels have extended frequencies up to 2.591GHz. The kit will work if you do not update the firmware, however if you update the firmware to unlock the rest of the channels on your DJI drone, you will be able to use all 32 channels. (DJI only opens 8 channels). The custom ARGtek panel antennas work best on CH 22 however they will work on the other channels also. This item is for the DJI Phantom 4 & Phantom 3 Advanced and Professional only. If you have any questions about this product by ARGTEK, contact us by completing and submitting the form below. If you are looking for a specif part number, please include it with your message.